Cafe Manolo owners and staff are sending this sad email today to customers and friends. I’ll print it verbatim — adding only that I wish I had been wrong. In the best of times it takes self-confidence, steel nerves and big bucks to open a restaurant in Westport. These are not the best of times. Let’s hope our pocketbooks and palate are where Manolo’s owners think they are. Let’s hope our usual aversion to parking more than 10 steps from a restaurant’s door doesn’t doom this new place. And let’s thank Manolo for rushing in where many other restaurateurs would not dare tread. With all that said, we regretfully have to announce that we will be closing our doors for good as of Saturday, January 7. Please do come out and enjoy Manolo’s cuisine and hospitality one last time. We will have a limited menu the upcoming 2 nights, and space will be tight, but we will try our best to accommodate each and every one. We will miss all of our loyal customers who have helped us stay in business as long as we did. Please do keep in touch with the Manolo team by finding us on Facebook under Manolo Restaurant. Thank you for this great journey. It’s definitely been a great one to remember. What a classy way to close. It’s a sobering way to start the new year. And a scary one to contemplate, as we drive down Church Lane and watch construction of a new restaurant and retail complex. Will this one work? Or will it be one more story of the same old, same old? Time will tell — but in the meantime: thank you, Manolo, for bringing grace and good dining downtown. This entry was posted in Downtown, Looking back, Restaurants and tagged Cafe Manolo, Pedro Garzon, Zest restaurant. Bookmark the permalink. Shocked and saddened… one of our favorite restaurants. I’ll have to ring them up right away for reservations tonight. I remember how kindly they accommodated us the night Trinity Church hosted the screening of Farmageddon. They expedited our service with style and grace and we enjoyed a delicious meal before scooting over to see the film. Manolo is a class act, and it is with a heavy heart that we will say goodbye. So sad! Our favorite restaurant in Westport! I can’t believe Viva Zapata is still open for business. Check out its reviews in Yelp.com. Yuck…. Viva Zapata = Nummy Yummy!!!! 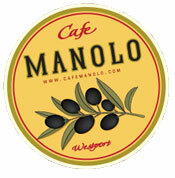 Manolo is one of our favorites in Westport and when a place that good closes, the town loses. What is all that talk about there aren’t enough restaurants? How and why does a restaurant with such great food end up out of business and what kind of help could have been offered to the owners to sustain the operation? I know the friends we’ve taken there from other towns will be shocked. No Big Loss! Food was adequate, but service was abominable. Damn it! I loved the mussels there. One complaint was that it was noisy as hell on weekends. Our favorite! Always felt at home and loved the half portions. The wait staff were always wonderful and the food more than adequate. Hugh loss. Maybe we should think about redeveloping downtown Westport. We can begin by actually heeding the recommendations of the Downtown Merchants. It’s heartbreaking to see Manolo’s go. Being there on Thursday nights, dancing to the great music of Jay Stollman, eating great food, and enjoying the company of those we met was always a high point of the week.